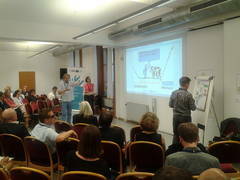 Delagates of the DanubEnergy lead partner Energieagentur der Regionen (EAR) present the DanubEnergy concept in Vienna. Bernhard Schneider (standing,left) presenting the DanubEnergy Concept. On July, 1st-2nd, the Central Europe annual conference 2014 was held in Vienna (Austria). More than 600 participants were informed about the priorities and funding possibilities of the EU Central Europe programme. At the same time, the conference served as a fair for exchanging and discussing ideas. Achievements of 124 projects implemented in the peroid 2007-2013 were presented and discussed among project partners, policy makers and other stakeholders from all over central Europe. In the workshop "Energy efficiency and renewable energies" the ideas and results of the DanubEnergy project were presented by the EAR delegates. Especially, Bernhard Schneider (EAR) explained that in Central Europe there is a lot of previously unused gras biomass available for bioenergy production - giving striking arguments that not all gras biomass is suitable for animal feeding.